Moderate, damask fragrance. 12 petals. Average diameter 4.5″. 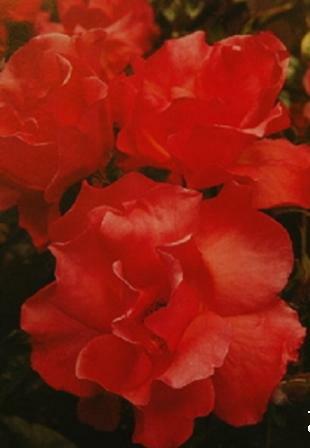 Large, semi-double (9-16 petals), cluster-flowered, in small clusters, cupped-to-flat, open bloom form. Prolific, blooms in flushes throughout the season. Medium buds. Medium, upright. Glossy, dark green, dense, holly-like, leathery foliage. Hybridized by Jerry F. Twomey (United States, 1991).